Ruse, Bulgaria, September 13, 2018 - Full hall, amazing rallies and great volleyball! 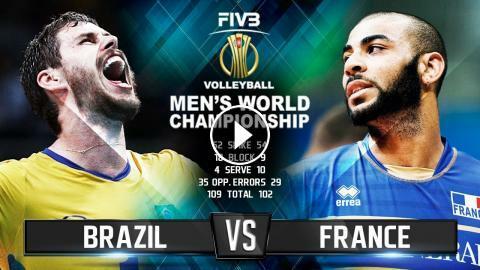 The clash of titans between Brazil and France turned in a real masterpiece and left more than 4500 spectators in “Arena Monbat” breathless. The current Olympic champions were three points behind in the final tie-break but managed to come back and to achieve second victory in Pool B after 3-2 (25-20, 25-20, 20-25, 23-25, 15-12) in this heroic battle.